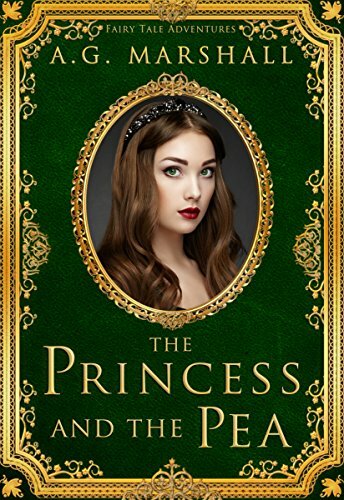 I was fortunate enough to receive a free ebook of The Princess and the Pea by up-and-coming fairy tale author A.G. Marshall from a promotion on Facebook. Since the book was named directly after the Hans Christian Andersen fairy tale, I was expecting a fairly direct adaptation. Instead, I was blown away by A.G. Marshall's originality. The book is a "fish out of water" story that delves into the creation of mythology and legend. The protagonist wakes up in another time that she knows nothing about, which allows the reader to explore this new world with her. I am a huge proponent of "fish out of water" stories, so the Fairy Tale Adventures series is one that I will be following closely from this point on. A.G. Marshall's The Princess and the Pea tells the story of a girl named Lina who wields a magic ring and fights goblins in the shadow world. Due to a sleeping spell that allowed her to stay in the protect the world from some dangerous threats, she wakes up to find that a century has passed and everyone she knew is gone. When she tries to dig into her own past, she learns that her story has become the myth of Evangelina Shadow-Storm, a bastardized version of the events that she had actually lived through. She gets involved in the competition to find a bride for the prince because she sees it as the only way for her to deliver her report about the dangers in the shadow world to the grand council, the only people who might still be aware that she exists. Many of the characters in this book have more knowledge than they let on. When Lina learns that her past has become fiction, she must do her best to pretend to blend in so that she won't be seen as crazy. Prince Alaric, who is obsessed with the story of Evangelina Shadow-Storm, notices Lina regularly skulking around the castle and searching the library for clues of what has happened while she was asleep. He knows that she is after something other than his hand in marriage, but he keeps her secrets in an attempt to earn her trust. Carina, one of the princesses that Lina befriends in the contest, puts on a completely different facade in public than she does in private. She has no interest in winning Prince Alaric, so she attempts to be as vapid and boring as possible, resulting in some hilarious antics. She is secretly a fierce warrior, who is all too happy to learn more about Lina's quest. The queen, a former goat herder, turns out to be hiding the biggest secrets of all much later in the book. What I love the most about Marshall's adaptation of The Princess and the Pea is that it portrays the way that people respond to fairy tales in a fairy tale setting, giving its audience a new perspective of the impact that these types of stories have on people. Prince Alaric is obsessed with what he believes to be the myth of Evangelina Shadow-Storm just as many of us find inspiration from stories about fictional princesses. It also acknowledges that many legendary characters such as King Arthur or Snow White may have originated as actual historical figures whose tales were exaggerated and fictionalized over time. Some of the changes that Lina learns were made to her story are horrifying to her but quite humorous in the context of the book. A lot of silly touches Marshall included such as Lina's password to the grand council and Carina's vapid acting skills made it a fun and light read, which was a welcome contrast to the dark turn the story could have taken if it placed more focus on Lina's family being dead when she woke up. A.G. Marshall's adaptation of "The Princess and the Pea" overwhelmed me with its sharp and exciting storytelling. It delves into the making of a hero and how some parts of a legend can stem from reality. I loved that Lina was a confused and lonely girl first and foremost and an epic war heroine second. The ability to do great acts does not require perfection. We are all capable of great deeds if we are willing to make the effort. The Princess and the Pea was thoroughly enjoyable from beginning to end thanks to its pristine pacing and perfect balance between comedy and drama. I highly recommend it to anyone who enjoys reading princess stories.